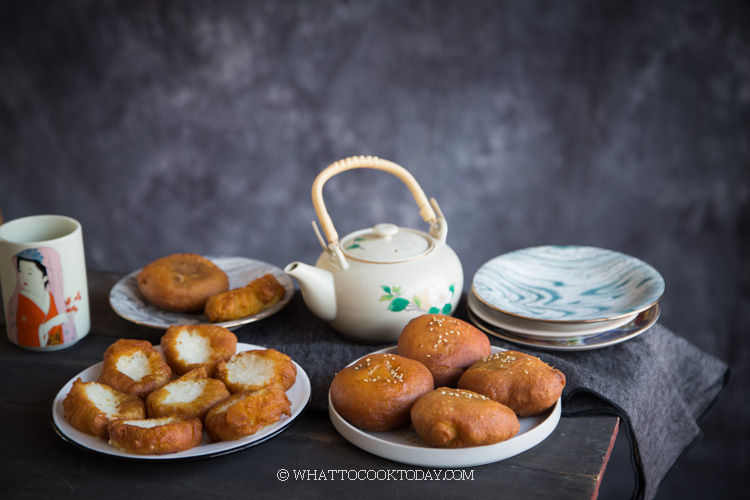 Ham Chim Peng (Chinese Fried Doughnuts) – Two Ways! I couldn’t help but thinking about grandma (my mom side) when I made ham chim peng a few months ago. My grandma loved ham chim peng, especially the one with glutinous rice stuffed in the middle of the dough. Every weekend we would visit grandma and mom would make sure she bought some ham chim peng with glutinous rice for her. I personally love both ham chim peng with glutinous rice and also the ones with sweet red bean paste (dou sha) stuffed inside, that’s my dad’s favorite too. Ham chim peng is of Chinese origin and obviously has made its way to Indonesia as well. 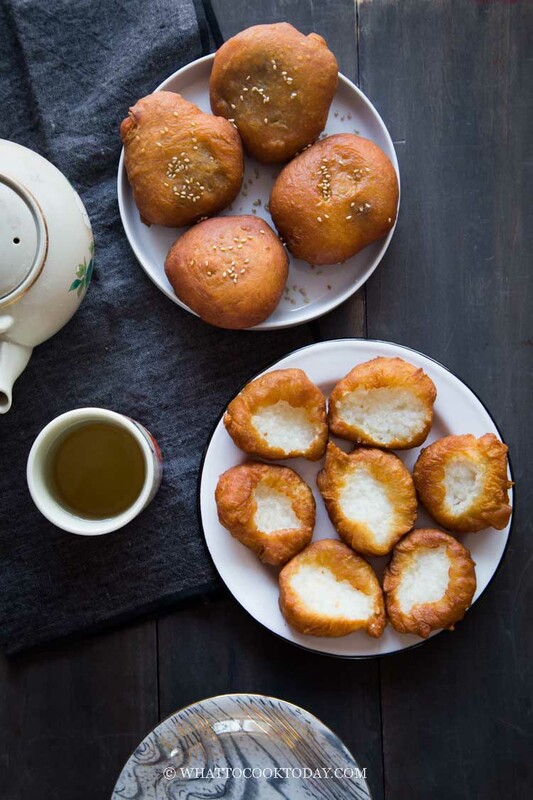 It is a popular tea time snack among the Indonesian Chinese and also the native Indonesian. It is called kue bantal in Indonesia. Bantal means pillow in Indonesia. It is named as such because of its softness. 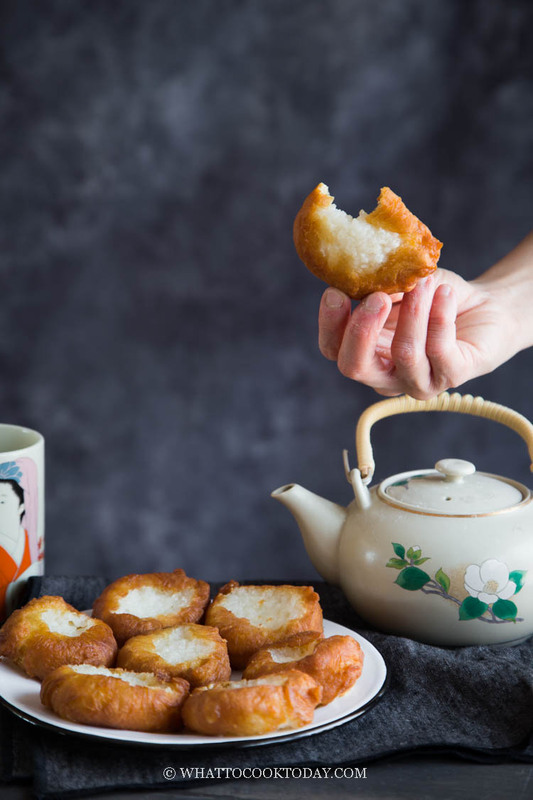 Unlike the Western doughnuts, ham chim peng is made without any butter, milk, and eggs. Ham chim peng is made with starter dough that has been proofed for 2 days and then mixed with bread flour, yeast, baking soda, alkaline water, and sugar to form a very sticky dough. 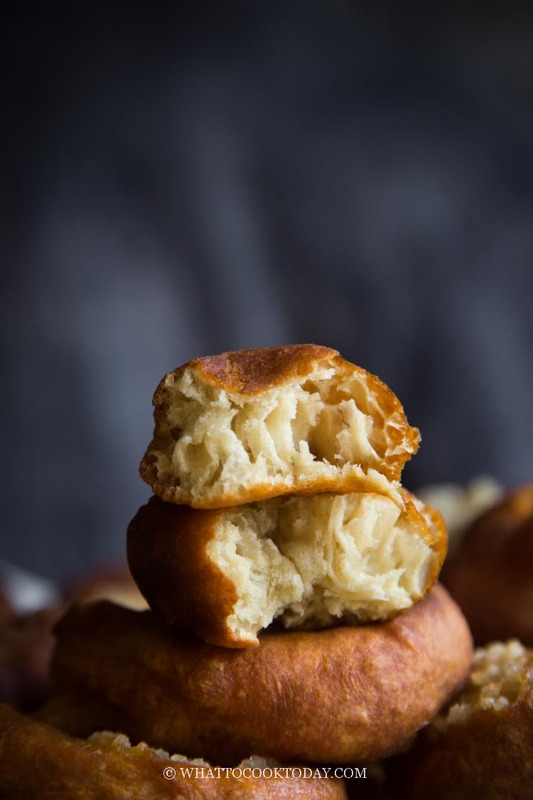 The dough is then shaped, filled (or not) and deep-fried. 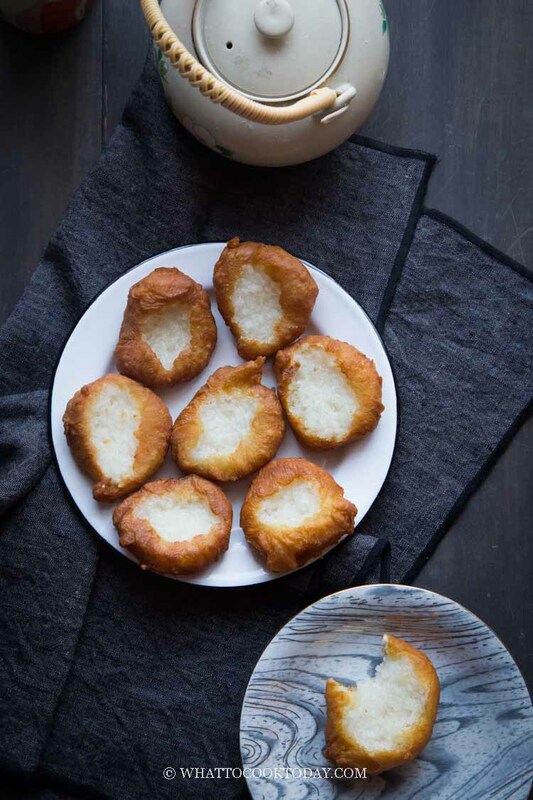 The result is incredibly soft and airy doughnuts. You will see large air holes inside the doughnuts when you tear it open. SPECIAL INGREDIENTS USED IN MAKING HAM CHIM PENG – TWO WAYS! Ham chim peng is not something that you can make out of a whim on the same day! Oh no my friend! Like I said, it’s not hard, but you need to plan ahead and make the starter that you have to proof at room temperature for at least 15 hours. Original recipe calls for 2 days (48 hours), but I had success with only 15 hours. This starter dough will work together with the main dough to produce incredibly soft and airy doughnuts. After that, the dough needs to be rested for 2-3 hours before you can start shaping. So, lots of waiting time, but not too labor intensive if you ask me. 1. It’s the best I’ve ever tasted. Like seriously!! The dough is soooo soft, light, and airy. 2. Large air holes inside the ham chim peng, which is what we are looking for. 3. I use pressure cooker the cook the glutinous rice, which requires no soaking for the rice and it’s cooked in 15 minutes, plus 10 minutes waiting time. 4. 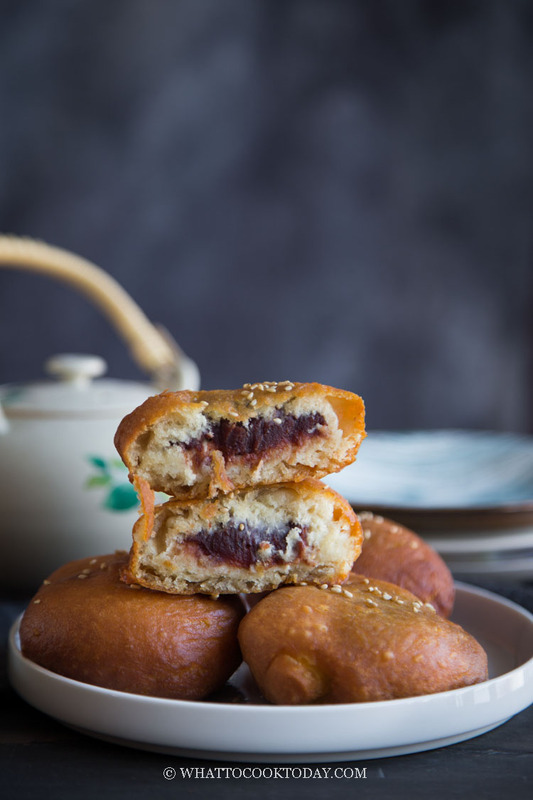 I use store-bought sweet red bean paste (dou sha) for the filling and that alone saves lots of time. Once you are done shaping and filling the dough, you can freeze them by placing them on a large baking sheet lined with parchment paper in a single layer until firm and then wrap each one in a plastic wrapper and place in freezer bag. Thaw before frying. You may need to dust with some flour if they get too sticky after thawing. Leftover ham chim peng can be stored at room temperature for about 2-3 days. This also depends on humidity. If it’s really humid where you are, it’s best to keep in the refrigerator for up to one week. You can reheat by wrapping them in aluminum foil and bake them in the oven at 350 F for 8-10 minutes in the oven. Recipe is adapted from Nasi Lemak Lover. The only ham chim peng recipe I ever need really! 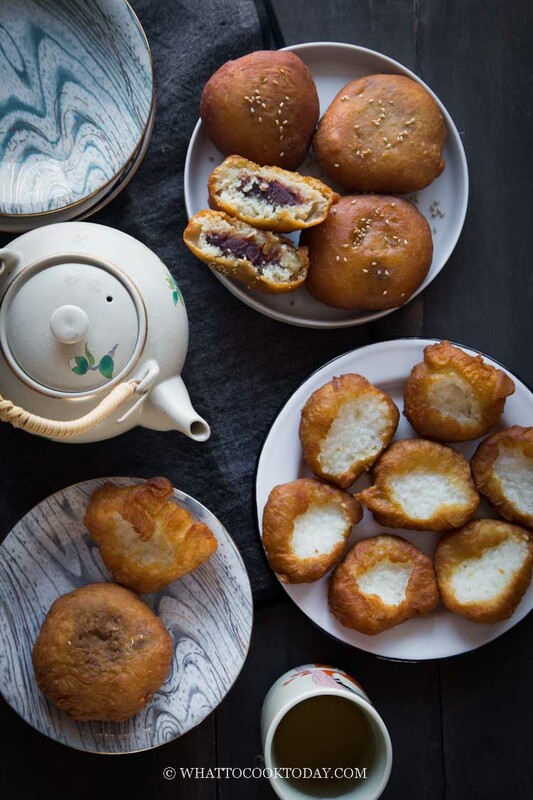 Soft dough is stuffed with white glutinous rice and another version with sweet red bean paste and then deep-fried. My favorite childhood snacks! Dust your working surface and your hands generously with all-purpose flour. Pour the dough out. The dough is very soft. Cut the dough into 10 equal pieces.